Tweezers, 1PK-104T, 120 mm, fine curved tip, Pro'sKit High quality fine and sharp tip (angled) tweezers for universal use from Pro'sKit (1PK-104T) with total length 120mm made from stainless steel (AISI304). Tip lenght 35mm. Resistant to acids. Non-magnetic. Made in Taiwan. 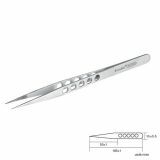 Tweezers, 120mm, straight, pointed, with a tooth Tweezers 120 mm long with a pointed and serrated tip made of high-grade, non-magnetic stainless steel. Tweezers, 120mm, straight, pointed Tweezers 120 mm long with a pointed tip made of high-grade, non-magnetic, stainless steel. 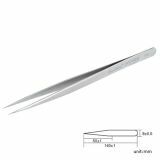 Curved Tweezers HRC40 ESD-15, 120mm, sharp tip Curved Tweezers HRC40 ESD-15 with total length 120 mm, sharp tip made of high quality, non-magnetic stainless steel. 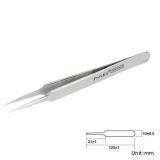 Tweezers 1PK-117T, cross-leg, soldering, 164 mm, curved blade, Pro'sKit Easy to use cross leg soldering tweezers from Pro'sKit (1PK-117T) with fiber/wooden handle, reverse, total length 164mm, curved blade made from stainless steel (AISI410). Magnetic-able. Heat-insulation. Resistant to acids. Made in Taiwan. Straight Тweezers, 1PK123T, 165 mm, Pro'sKit High quality heavy-duty straight magnetic tweezers from Pro'sKit (1PK123T) with 165mm lenght and 50mm tip lenght, fine tip made from stainless steel. Used in electronics, jewellery, watch and sunglasses repairs. Made in Taiwan. 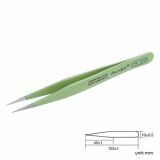 Straight tweezer, 1PK-105T, 140 mm, fine tip, Pro'sKit Straight tweezers with very fine tip from Pro'sKit (1PK-105T) with total length 140mm mede from high quality stainless steel (AISI304) with anti-acid and anti-oxidation advantage. Suitable for work in electronics and precision engineering. Non-magnetic. Made in Taiwan. List Price 5.50лв. VAT Incl. 5.22лв. VAT Incl. Straight Tweezers, 1PK-101T, 120 mm Straight Tweezers, 1PK-101T, with length 120 mm. List Price 3.90лв. VAT Incl. 3.70лв. VAT Incl. 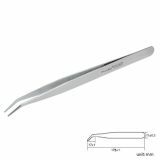 Curved Tweezers, 1PK-106T, 175 mm, Pro'sKit Curved tweezers, 1PK-106T, with length 175 mm, nickel-plated steel. 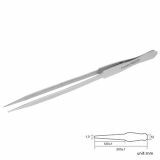 Straight Tweezers, 1PK-102T, 200 mm Straight tweezers, 1PK-102T, with length 200 mm, stainless steel. A wide variety of tweezers for technical purposes with straight, curved, shovel edges; insulated and uninsulated; magnetic and non-magnetic sets and single items.